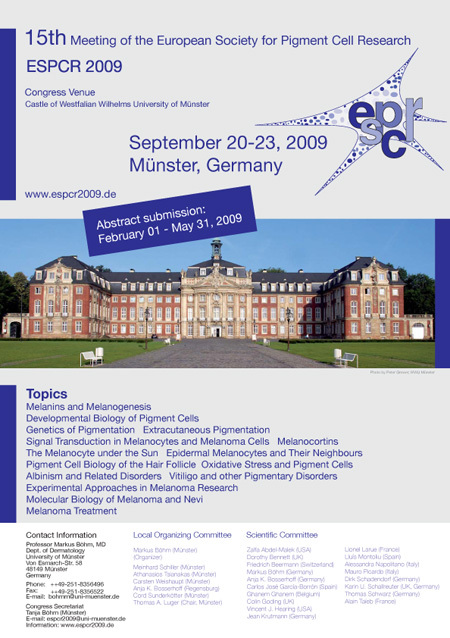 On behalf of the Organizing Committee it is a pleasure to inform you that the Abstract Submission and Registration for the 15th Meeting of the European Society for Pigment Cell Research (ESPCR) to be held in Munster, Germany, September 20-23, 2009, is open. Special registration rates apply for ESPCR members and young investigators. There will also be a limited number of travel grants for young researchers. We encourage you to visit our ESPCR 2009 congress homepage for further information such as the Congress venue, preliminary program, abstract submission, registration, accommodation, and social events. We look forward welcoming you in Munster in September 2009 for a vital and superb Meeting! Registered IFPCS Members are entitled to access full online contents of the scientific journal Pigment Cell & Melanoma Research (PCMR), through the MEMBERS-ONLY area of the IFPCS web site. Exclusive access requires unique (personal) username and password combinations, available for each registered IFPCS member. These parameters can be easily requested to the system, which will send an automatic reminder to the email address associated to the corresponding registered IFPCS Member. If you are a registered IFPCS Member and fail to access the MEMBERS-ONLY area of the IFPCS web site, please contact the IFPCS webmaster who will fix the problem and inform you what to do.